The Illinois Bicycle Lawyers at Keating Law Offices have been retained to represent a Champaign, Illinois bicyclist who was rear-ended at a red light. The bike acccident occurred in August of 2011 just after 5pm.While this may sound like a simple case, it becomes quite interesting when considering the following facts: 1) the bicyclist was wearing a yellow safety vest; 2) the bicyclist had not one but two flashing rear lights; and 3) it was still light out at that time of the evening in August. The motorist was ticketed at the scene for failure to reduce speed to avoid a collision under Section 625 ILCS 5/11-601 of the Illinois Motor Vehicle Code. The bicyclist suffered multiple injuries, including the aggravation of a pre-existing medical condition. In Illinois, the aggravation of a pre-existing medical condition is the same as causing a new injury. According to Illinois Pattern Jury Instruction (IPI) 30.03, the "aggravation of any pre-existing ailment or condition" is an element of compensable damages. If this case goes to trial, the bicycle law attorneys at Keating Law Offices will be able to argue that not only is the car driver responsible for new injuries, but also that the car driver who caused this bike accident is responsible for the aggravated "old" injuries. 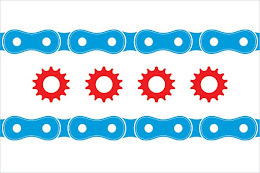 The Illinois Bicycle Attorney at Keating Law Offices have handled cases in literally every corner of the State of Illinois. Attorney Mike Keating is also licensed to practice in the United States District Court for the Eastern District of Wisconsin. This covers most of the southeastern portion of Wisconsin containing Milwaukee and its suburbs.